experience that's as pain free as possible! We use only luxurious, cruelty-free false lashes. We proudly carry Jan Marini Skin Care products for use in our facials and Peels. All products available for retail! From start to finish, a deep pore cleansing treatment totally customized to address your skin care needs and concerns. After a detailed skin analysis, our Esthetician will formulate the best treatment for your skin type and conditions. This facial uses Proteolytic Enzymes to exfoliate and resurface the skin to give an immediate improvement in texture and clarity while leaving the skin looking and feel smoother and more refined. Lay back, relax and enjoy! The Age Intervention Regeneration Facial incorporates exceptional topical anti-aging and skin regeneration technologies that will benefit any skin type. The Age Intervention Regeneration Mask incorporates a host of powerful anti-aging antioxidants including the red wine longevity extract, Resveratol, all combined with remarkable skin rebuilding peptide blends. The mechanism for this intense and immediate targeted infusion enables the skin to absorb and retain far higher levels of skin regenerating actives while resurfacing is taking place leaving you with younger looking skin! 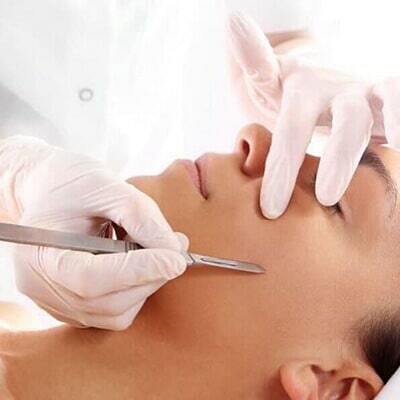 Before treatment, a detailed consultation regarding your acne, diet, lifestyle and beauty products will be discussed. This treatment includes a deep double cleansing and exfoliation with the use of steam, focusing on softening blackheads, and impacted pores for easier extractions. This treatment utilizes the highest concentration of retinol and multiple advanced technologies for enhanced resurfacing and skin refining effects. This corrective facial will provide immediate visible skin retexturization and refinement, along with greater smoothness and skin hydration. Shaving can create unique problems on a man's face that may include razor burn, chronic dryness, ingrown hairs, clogged pores, inflammation and occasional acne breakouts. This all-inclusive treatment is designed to immediately soothe irritated skin, deep clean clogged pores and gently remove dullness as it hydrates and reinforces skin's natural protective barrier. Prepare to be smooth to the touch! If you're on the go and would like to squeeze a facial into your busy day, then this is the facial for you. Designed to give you the advantages of a facial in half the time. Includes a double cleanse, exfoliation, a proper masque to suit your skin's needs and appropriate moisturizers to give your skin a healthy, radiant glow! *Please note this facial does not include extractions. This hard to reach area can easily get neglected so this treatment is the perfect remedy! The Proteolytic Enzyme Back Treatment is a scientifically based method of effective exfoliation and skin resurfacing designed to address acne, dry skin and various common back conditions. The term proteolytic refers to an enzymatic reaction that works selectively to digest only damaged and dead skin cells without harming normal living cells. Clinical treatment that includes a cleanse, degrease of the skin, Dermaplane, appropriate serum, moisturizer and SPF. This is a great express treatment! Your skin will look brighter and feel amazing! Its perfect right before a big event and your make up will look flawless! This is the perfect treatment if you have more time to spare and want to indulge in a more relaxing "spa facial" experience. This facial will include a double cleanse, degrease, dermaplane, an enzyme or peel suited for your skin, a hydrating mask, light facial massage, as well as an arm and hand massage, followed by the appropriate serums and moisturizers. Your skin, body and mind will be refreshed! Uncover radiant, more youthful skin in minutes with the Marini Peel System! Deeper peels designed for those looking for a more significant skin rejuvenation in fewer treatments than Glycolic Peels, but with less down time than a more aggressive procedure. The advanced, 2-step Marini Peel system combines a targeted peel selected for your needs with a concentrated retinol activator that is packed with retinol, anti-aging peptides and antioxidants to enhance your results and jump start the healing process. Specialized formulas target your needs for dramatic improvement in skin rejuvenation, acne, discoloration and more. Visible improvements are evident after just one peel with progressive benefits over a recommended series. Speak with one of our knowledgeable estheticians to determine the best peel and strategy to meet your skin care needs. The Refine Peel is designed for individuals of all skin types seeking significant skin rejuvenation from a minimum number of peels. A blend of Lactic, Salicylic and Citric Acid with a Retinol and Peptide Activator enhances the results and jumpstarts the skin's healing process with antioxidants to calm the skin. Clarify Peel is ideal for anyone seeking a serious solution for acne and oily skin. This peel is also a great solution for resurfacing and rejuvenation on darker skin and those looking for a peel that is stronger than our Refine Peel. Salicylic and Mandelic Acids dissolve oil to penetrate and clear follicles for maximum results while a Retinol and Peptide Activator enhances the results and jumpstarts the skin's healing process with antioxidants to calm skin.